Once you have built or selected which screen or screens you will trade, here's a few tips on how to trade the strategies. Whether you�ve decided you want to trade every week, every two weeks, every four weeks or even every twelve weeks, the process is the same and very quick. At the beginning of each period (whether weekly, monthly or quarterly, etc. ), you will run your screen for Monday morning and see what stocks come through. Note: What �for� Monday morning means is that you�ll run your screen on either Saturday evening, or anytime on Sunday or Monday morning to see what stocks come through. If you decide to use a 4-week rebalancing period, then you�ll run your screen only once a month (or every four weeks). For this example, let�s say you choose a strategy that always gives you five stocks. On the first week � Monday morning � buy all the stocks that make it through your screen. Each stock should be purchased with an equal dollar amount. 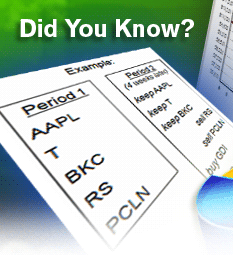 In other words, an equal amount of money would be put into each stock for an equal dollar weighted portfolio. You�re then going to hang on to those stocks for the duration of the holding period, (i.e., holding period) � which in this case is four weeks. Four weeks later, run the screen again and see what stocks come through. This time, keep the stocks that still qualify, sell the ones that no longer qualify (whether it be at a profit or a loss � sell them), and buy any new stock(s) that comes through. Run your screen for Monday morning. Buy all of the stocks in an equal dollar weighted manner. Hold on to those stocks for the duration of your holding period, i.e., four weeks. Keep the previously qualified stocks that still qualify. Sell the ones that no longer qualify. Buy any new qualifying stocks. Hang on to those for four weeks (or whatever rebalancing frequency you�ve selected). Four weeks later � do it again. Some strategies do better when rebalanced once a week. Others perform better when rebalanced every two weeks or every four weeks. Other strategies do better rebalancing every twelve weeks (like dividend paying strategies or even value strategies). But regardless of your rebalancing frequency, it will only take about 10 minutes to rebalance your portfolio�whether it is once a week, once a month or once a quarter. And just because you�re rebalancing your portfolio every week, doesn�t mean you�re turning your entire portfolio over every week. All it means is that you�re checking on your stocks more frequently to make sure they still qualify. If they still do, nothing needs to be done. If some don�t, you�re simply exchanging them for new ones that do -- ones that do meet your specified stocking picking criteria. When you run a backtest, be sure to check on the turnover ratio to see how often you�ll be turning your portfolio over. Trade a strategy you like. If you don�t like stocks making new 52-week highs, even though it�s a great strategy, don�t trade it. If you prefer to trade once a month or even once every three months, do so. 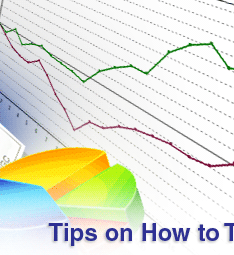 Don�t try to make a weekly strategy work for you if you simply don�t want to trade every week. Also, don�t try to fit yourself into longer term rebalancing period, if you want to be active. 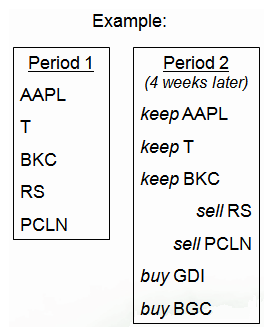 Another way to trade these strategies is by using a combination of both 4-week and 1-week holding periods. This can also be very effective. This is done by running the screen on a weekly basis, but holding those stocks for a 4-week period. Run the screen at the beginning of the week. Buy all of the stocks that come through the screen. Hang on to those stocks for the next four weeks. Then, next week, run the screen again. Buy any new stocks that made it through the screen and be sure to hang on to those stocks for the next four weeks. Repeat steps 4 and 5 for the next two weeks. Remember, each week a stock comes through the screen, a new 4-week hold count begins. If a stock never comes through again, sell the stock in four weeks. So, even though a 4-week holding period is being used, the screen is being run weekly and only a portion of the portfolio is being rebalanced each week. One of the benefits to this strategy is that if you�re running a great screen, you are now participating in every start date, meaning you�ll have the opportunity to pick up any and every new stock that comes through at the beginning of each period. This strategy will help you increase your returns and smooth out your performance. Even though running your screen each week is a an active approach, you are also incorporating a longer hold time (in this case, four weeks) for stocks coming through the screen each week. This is also a good approach if you have a larger portfolio and want to include more stocks in your portfolio at any one time. Another approach, if you decide to trade multiple strategies (two or more), is to begin each one on different start dates. For example, if you decide to trade two strategies and you�re going to use a four week holding period for each of them, you might decide to start one at the beginning of the month and then start the other one a week later or maybe wait until the middle of the month to get started with that one. So you�re now going to rebalance a portion of your total portfolio every couple of weeks by rebalancing the different strategies you�re trading at different intervals. Not only are you diversified by trading different strategies, but you�re also diversified by having your screen pick them at different times. 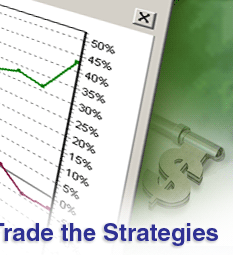 Trading your strategies can be easy and should be easy. One of the key points to trading success is being able to just do it. But if it�s hard or time consuming, you�ll find yourself not doing it. And even the best trading strategy, if you don�t use it, won�t make you any money. alignment with how you want to trade.